People at the launch of the Scarborough Sunset Markets. AN unequivocal success, the Scarborough Sunset Markets are set to return next summer. 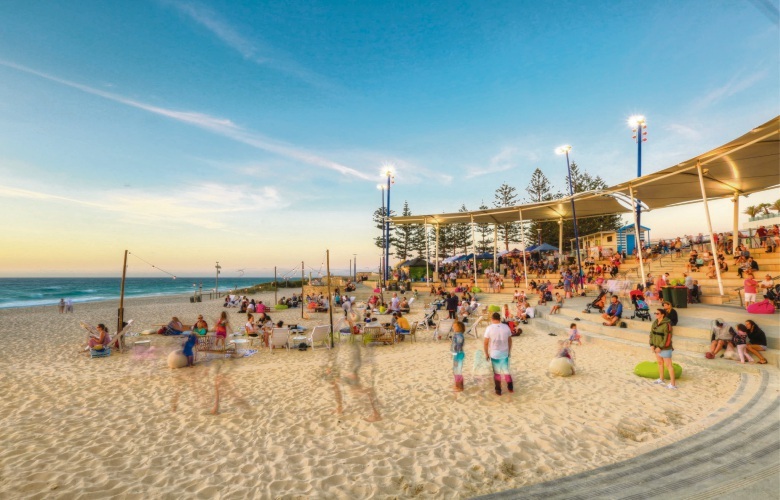 The Scarborough Beach Association initiative aimed to lure people back to Scarborough while construction on the redevelopment wrapped up. It did that and more – attracting on average 6000 visitors each Thursday evening. Association chairman Wayne Bowen said they wanted to create a quintessential WA beach experience of surf, sand, sunsets, food, music, family and friends (and canine companions). “We provided an opportunity for families and friends to gather and eat and enjoy our beautiful beach,” he said. “We made sure the atmosphere was right and represented everything that we love about Scarborough. Businesses involved and visitors to the markets were surveyed and 94 per cent of respondents rated the series as very good or excellent. Mr Bowen said a large majority of respondents said what they enjoyed most was the food, beach setting and relaxed community vibes. “We think it’s a fair assumption the markets have breathed new life back into the area and celebrated what is magical about a Scarborough summer,” he said. The association plans to continue the markets next summer and aims to make it a must-do for tourists. Mr Bowen said they wanted to activate and explore the new spaces in the redevelopment and had some new elements to add to the evening. “(It will be) bigger and better but keeping the same Scarborough vibe,” he said.